“I did it all by myself!” he said proudly………. Today was enormous, to say the least, because today was Under 8’s Day at our school. Under 8’s Day is all about celebrating being a young child. Every child and teacher from Prep to Year 3 were involved as well as parents, our specialist teachers and our local police, fire and ambulance officers. We also had some very cool companions such as snakes and lizards, some very cute and cuddly baby barnyard animals and tennis time with free coaching clinics. Every teacher organised an activity and these ranged from the basics such as painting, play dough, bubbles and clay to face painting, treasure hunts, goop, masks and crowns. Kites were very popular as well, particularly as it was such a very windy day. Anyone who has worked with young children knows how wind can effect them, and after doing play ground duty during the morning tea break, I was a little apprehensive about how the children’s behaviour would be once back inside the classroom. I was pleasantly surprised to find that they were quite settled and ready to chat about their morning. We talked about all the things they had done and looked at all the things they had made. I asked them to choose their favourite memory from the morning and draw a picture of it. They asked if they could have some special paper, meaning a page with a border. 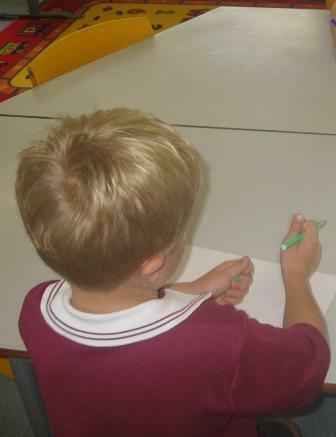 After printing off 3 different pages to choose from (because they couldn’t decide which one they all wanted) the children happily began to draw. When a task/activity is valid and meaningful to children they are far more engaged and this was demonstrated when I saw the amount of detail and care they put into their memory drawing. This engagement continued into their “have a go writing” about their drawing. In my class I have a child who is not a risk taker when it comes to drawing about a topic such as a memory and is very reluctant to have a go at writing. He appears to think he can’t do it unless it is exactly right. Over the last few months one of my goals for this child has been to provide him with support and encouragement to enhance his self confidence so he would have a go, particularly with his writing. He is able to identify and write down sounds he hears in words when I am with him one on one. His favourite memory of today was having his fingerprints taken by the visiting police officers and sitting in their police car. After choosing the paper he wanted, he quickly began to draw the police car. This was something in his comfort zone as he loves cars and draws them a lot. The children wanted to display their drawings for all the parents to see and as the children finished them, I was putting them on the wall. When this boy brought me his drawing to look at and display he said “I did some writing”. I was absolutely thrilled and told him so, after which he showed me where, on the wall, he wanted it displayed. It was a very proud moment for all of us. Going with the flow and where it can lead you.